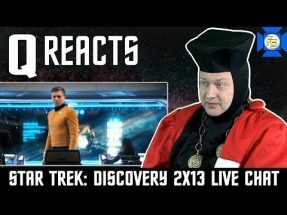 Q Reacts to Star Trek Discovery Season 2 Episode 12 – “Through the Valley of Shadows.” He will pass judgment on this episode, which features the appearance of a fourth red signal, hostile Section 31 ships and Klingons. Wonder if they ate any good books lately. Burnham has questions for Tyler, and Pike, Spock, Tilly and the rest are fumbling about as lesser beings do. Q will recount the highlights and lowlights. 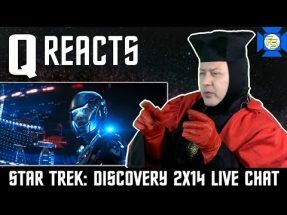 Star Trek Discovery is one of the most loved and hated Star Trek series in a long time. 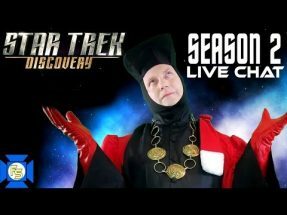 Fans are rabid with their praise and detractors range from those concerned about continuity to those who fear the show will corrupt their lives beyond recognition. Q advises them all that… it’s a show. Love it, hate it, but at the end of your Earth day, it’s not going to make a difference in your life unless you have a serious problem. In which case you need to seek the help of a mental professional. 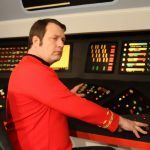 Q will again pass judgment on this episode and the antics of Burnham, Pike, Tilly and all the rest. After which he will go on with his immortal existence, unconcerned with petty humans and what they call entertainment.